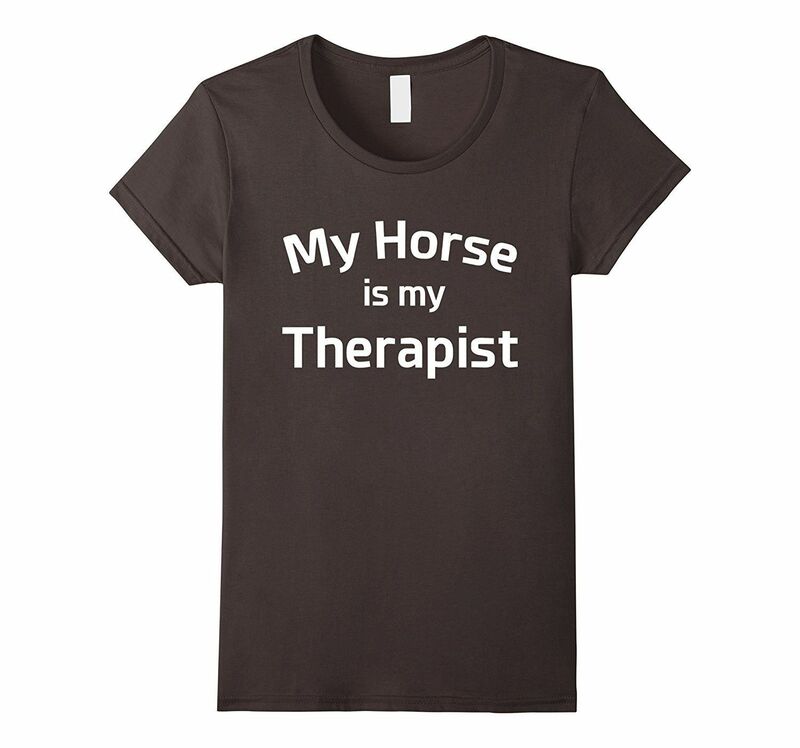 You’ve all seen them; those kitschy t-shirts, hats, and signs that proclaim, “My horse is my therapist.” I openly admit, I’ve contemplated buying one of those before or making a sign of my own with this endearing saying for the barn or my home. I liked it. It hit home for me. I felt it concisely and cleverly conveyed the feeling of appreciation and gratitude I feel for what not only my horse has done for me, but for what hundreds of horses I’ve worked with have done for me and so many others. To be frank, I didn’t actually think about it too much. I felt something about it, my left brain filtered it into the “good” category and I moved on from there. I never bought a shirt or hat or made a sign, but it remained in that “good” category in my brain until recently. I haven’t noticed the saying pop up anywhere in a long time, but just a few days ago, I heard someone say it in passing. I didn’t notice any kind of new thought or feeling about it as I heard it, but I noticed a sensation in my gut. Since I’ve been working diligently the last few months to become more connected and in tune with my body, I was immediately able to recognize that sensation as a warning signal. This particular signal usually means something feels unsafe, incongruent, or off in some way. I was busy with something else that needed my attention at that moment, so I simply took note of my body’s response and set it aside for later reflection. What about that saying would cause a visceral response from me? Once I had a moment to reflect, it took probably .22 seconds for me to find the answer. You might think I’m exaggerating, but I’m not. See, when I open the door for the higher regions of my brain to listen to and connect with the signals coming in from the lower regions and my body, it literally takes my brain that long to process the information. Well, no one has scanned MY brain and measured it, but neuroscience says that’s about how long it takes in a human brain, so I think it’s a pretty fair estimate to say that’s how long it took mine to come up with the answer. And it’s a simple yet complex answer. The simple part- my horse is NOT my therapist. My therapist is my therapist. My horse is my horse. (Hmmm…I like that saying. Could this be the next NL t-shirt?) The complex part- I feel good when I am around my horse, which can actually be very therapeutic for me. But that doesn’t make it therapy. Seriously, have you ever been to therapy? I have and I can say when I get in the weeds and start doing the hard work on myself, it does NOT feel good. Let’s say it doesn’t always feel good when I’m working with my horse because I do have to work on myself in the process. It can still feel like therapy when I am with my horse, which can feel like my horse is conducting therapy on me. But she’s not. She’s just being a horse interacting with a human. Just like my dog is being a dog interacting with a human when we are together. Just like my dad is being a human interacting with his daughter, and my brother is being a nuisance..err.. I mean, human interacting with his sister, and the cashier at the grocery store is being a human interacting with a customer. And since I have come to learn to see horses as beings just as capable of making requests and choices for healthy relationship as humans, I just can’t tolerate that saying. It makes me sick to my stomach because for me it is the same as saying my dad is my therapist. Say it out loud and tell me that doesn’t make you cringe. And what about my brother is my therapist? Sound good to you? Now try this one- my cashier is my therapist. Ok, so that one makes me giggle a little, but only because it sounds so absurd! Being steeped in horsemanship and traditional horse training methods, I understand how this saying came about as we humans have a long history of projecting onto and objectifying animals. I see how it could be argued that giving your horse therapeutic powers even though he never completed high school, is an enormous leap from how horses have been treated historically by humans. That’s probably why it got filtered into the “good” category in my brain years ago. But making your horse your therapist is still objectifying, it’s still projecting, it’s still using your horse. So, let’s take the next leap in our development as human beings and figure out how to interact with horses as what they actually are…horses. To learn more about how we do this at Natural Lifemanship, visit the Start Training link or view our online videos and content.